Humanity is on the threshold of being able to detect signs of alien life on other worlds. By studying exoplanet atmospheres, we can look for gases like oxygen and methane that only coexist if replenished by life. But those gases come from simple life forms like microbes. What about advanced civilizations? Would they leave any detectable signs? They might, if they spew industrial pollution into the atmosphere. New research by theorists at the Harvard-Smithsonian Center for Astrophysics (CfA) shows that we could spot the fingerprints of certain pollutants under ideal conditions. This would offer a new approach in the search for extraterrestrial intelligence (SETI). "We consider industrial pollution as a sign of intelligent life, but perhaps civilizations more advanced than us, with their own SETI programs, will consider pollution as a sign of unintelligent life since it's not smart to contaminate your own air," says Harvard student and lead author Henry Lin. "People often refer to ETs as 'little green men,' but the ETs detectable by this method should not be labeled 'green' since they are environmentally unfriendly," adds Harvard co-author Avi Loeb. The team, which also includes Smithsonian scientist Gonzalo Gonzalez Abad, finds that the upcoming James Webb Space Telescope (JWST) should be able to detect two kinds of chlorofluorocarbons (CFCs)—ozone-destroying chemicals used in solvents and aerosols. They calculated that JWST could tease out the signal of CFCs if atmospheric levels were 10 times those on Earth. A particularly advanced civilization might intentionally pollute the atmosphere to high levels and globally warm a planet that is otherwise too cold for life. There is one big caveat to this work. JWST can only detect pollutants on an Earth-like planet circling a white dwarf star, which is what remains when a star like our Sun dies. That scenario would maximize the atmospheric signal. Finding pollution on an Earth-like planet orbiting a Sun-like star would require an instrument beyond JWST—a next-next-generation telescope. The team notes that a white dwarf might be a better place to look for life than previously thought, since recent observations found planets in similar environments. Those planets could have survived the bloating of a dying star during its red giant phase, or have formed from the material shed during the star's death throes. While searching for CFCs could ferret out an existing alien civilization, it also could detect the remnants of a civilization that annihilated itself. Some pollutants last for 50,000 years in Earth's atmosphere while others last only 10 years. Detecting molecules from the long-lived category but none in the short-lived category would show that the sources are gone. "In that case, we could speculate that the aliens wised up and cleaned up their act. Or in a darker scenario, it would serve as a warning sign of the dangers of not being good stewards of our own planet," says Loeb. 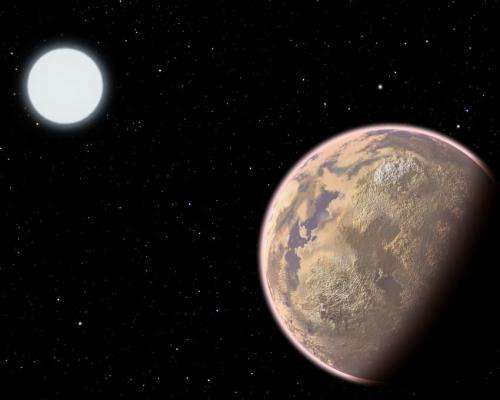 Could chlorofluorocarbons someday provide evidence of alien life? This depends on your definition of intelligent. First off, you have to identify a planet suitable for life in an earth-like manner, with an oxygen rich atmosphere, and so far I believe we're batting zero on that? But never mind, let's suppose we can find lots of those. Then you have to find intelligent life, which has existed on this planet for what? 40,000 years to be generous? Advanced life has been on this planet, for say 400 million years, give or take a hundred, right? So that period comprises .0001 of that time. Then you have to be looking at that civilization as it just happens to be in an early or middle industrial stage, where we've been and will be at for maybe 400 years, to be generous. So that period comprises .000001 of that time. The odds of actually stumbling across such a civilization and then not being fooled by natural processes (after all, we "found" life on Mars, so our machine said) . . . . that's worth spending precious science money on? . . . . that's worth spending precious science money on? I dunno. How much money do you think is being spent (or might be spent) on this activity? I'm betting in relative terms, not much. What else (in science, since you've constrained it to be so) would you spend it on? Much of science involves spending a bunch of resources on something that ultimately doesn't pay off. I'd guess you understand that. I'm confused as to why you don't seem to like this particular avenue of research. I also question the validity of your back-of-the-envelope calculations. ..The odds of ...spending precious science money on? Has the time dimention been taken into account, as it may likely effect any results from a study like this? Considering the Universe is about 14 billion years old, whereas earth has only existed about 4 billion years. And considering Modern Man has only been around for a few hundred thousand years, and the Industrial Revolution only began about 200 years ago but today we're starting to address problems of pollution on earth. It's possible, within another 100 years or so, either pollution or humans will no longer exist on this earth. It seems to me the chance of locating another form of intelligent Alien life existing at the same time window as humans on earth, in a 14 billion year old Universe has a very small probibality for success. O2 in our atmosphere is pollution, the waste product of eons of life. Entropy is an unavoidable product of life. Industrial pollution of the sort we are now generating will probably last only a few hundred years as we develop more efficient ways of producing energy and of cleaning up the dirt we have already produced. Here is a proposal to search for the waste heat of advanced civilizations which should be generated on much longer time scales. Has the time dimention been taken into account, as it may likely effect any results from a study like this? The window of opportunity is small (and it may be even smaller if intelligences are more likely to develop ocean- or subsurface based than land based). Just like (possibly) the window of opportunity is small for detecting intelligences by radio transmissions. And if there's some better way of sending information than EM then that might drop to zero in the future altogether. That said: a small window of oppurtunity multiplied by many billions of planets to look at might still yield results. I'm just saying SETI is a waste of time, always has been. The odds of getting results are so miniscule compared to the effort, that's it's just silly. There are a million things more beneficial we could be doing with that money, in astrophysics alone. "A small window of oppurtunity multiplied by many billions of planets to look at might still yield results." Theoretically that may be true; however, given our curent state of technology, we can only explore the billions of planets with pin-prick observations. Its a noble quest, but again it seems, for now, we're constrained by time. I'm just saying SETI is a waste of time, always has been. The odds of getting results are so miniscule compared to the effort, that's it's just silly. Even if the odds are low and the costs are high (which they aren't compared to some other freaky things we are pumping thousands of times more money into - like military hardware) ...if the potential gains are huge it's worth it. And I can hardly think of anything that would be bigger than finding extraterrestrials. Can you? however, given our curent state of technology, we can only explore the billions of planets with pin-prick observations. Are you in a hurry? The rate of discovering planets has jumped orders of magnitude in past years. So what if the observation/analysis takes 100 (or 1000) years? Wouldn't it make more sense to look for the presence of street lights (sodium lines etc. )?